Chronic pain is a complex and confusing problem. Unlike acute pain, which is well correlated with injury, chronic pain is often unrelated to tissue damage. It might be driven by a wide variety of factors like sleep, mood, thoughts, or emotions. And chronic pain is connected with other health problems like obesity, anxiety, depression, or IBS. We can better understand the complexity of chronic pain, and its relationship to other multi-symptom disorders, by learning something about systems theory. I recently discovered two excellent papers which discuss pain and stress from a systems perspective. You can read full text versions of them here and here. The basic idea is that chronic pain is often driven by dysregulation of a “supersystem” that coordinates defensive responses to injury. The supersystem results from dynamic interaction between different subsystems, most notably the nervous system, immune system, and endocrine system. Following is a detailed but simple description of what we can learn about chronic pain from this systems perspective. And more importantly, what we can do about it. First, a bit of warning. This article is a little bit on the long side. But it's one of the best articles I've written. And I've thrown in lots of pictures and very cool examples to illustrate the points. So grab a cup of coffee and get ready to learn some fascinating concepts that will give you insight into almost anything involving human health. A system is a related set of parts that interact to serve a common objective. A complex system is composed of parts that interact to produce collective behaviors that are more complex than the sum of the individual behaviors. For example, in economies, ecologies, weather, traffic flow, bird flocks, and schools of fish, the individual agents behave in a simple way, but their interactions produce an orderly pattern that is very complex. A complex adaptive system, such as an organism, is one whose behavior is not merely reactive to its environment, but purposeful and proactive. Thus, a complex adaptive system has some degree of agency and intelligence. Examples include beehives, insect colonies, and the immune system. In each case, the individual players in the system robotically obey patterns of behavior that are very simple. But the interactions produce a collective behavior that is highly intelligent and adaptive. Where does this intelligence come from if not the individual players in the system? The behavior of a simple system is often governed by a central controller. For example, in a home heating system, the thermostat controls whether the heat turns on or off. In a complex system, control is not located in any particular area, but emerges from the complex interactions of all the different parts. For example, a termite colony is an incredibly sophisticated architectural project, but there is not a single termite that knows how to build it. Instead, each termite is just following its own simple algorithm for behavior. This reminds me of Dan Dennett's view on the nature of human intelligence: it cannot be localized in any one part of the brain. There is no "wonder tissue” imbued with magical powers of cognition, or homunculus that perceives sense data. Instead, cognition emerges from the complex interactions of billions of tiny cells, none of which are any smarter than a bacterium. Similarly, the intelligence which coordinates the pain alarm system is not housed exclusively in the nervous system - it emerges from the nervous system’s interaction with other systems of the body, including the immune system and the endocrine system. Because the intelligence which creates pain is widely distributed throughout the brain and indeed the body, there is no central control switch that we can flip to get someone out of pain. Instead, we need to change the behavior of the system as a whole. Complex adaptive systems are nested - they are composed of subsystems, which are in turn composed of smaller subsystems, which have their own subsystems, etc. For example, the nervous system is made of parts like the brain, spinal cord and peripheral nerves, which are made of different types of cells, and so on. Each subsystem has varying degrees of agency and intelligence. For example, a neuron can in some sense "decide" which neighbors to form synapses with. A termite can decide where to dig, etc. We can turn our attention to various levels of hierarchy in the nested systems, zooming in and out of focus on different levels of complexity. There is nothing reductionistic or fallacious about considering the behavior of just one part of the whole, as long as we remember it is only a part. For example, in examining why someone has pain, we can focus attention on the nociceptors. Although they are a relatively stupid and robotic little subsystem in the pain alarm supersystem, they do have some degree of intelligence, and can “decide" whether to report certain threats to the brain. We can alter their decision-making behavior, for example, by taking NSAIDS to reduce local inflammation and lower their sensitivity. The dorsal horn of the spine is a more complex subsystem with more moving parts, and therefore more intelligence and agency. It receives nociceptive signals from the periphery and then decides whether to report them to the brain. Like the peripheral nerves, the sensitivity of the dorsal horn can be adjusted. For example, the brain can desensitize the dorsal horn through descending modulation. As we look at higher level supersystems like the brain, we find far greater levels of intelligence and control over pain. Because this intelligence does not live in any particular place, but instead in a fabulously complex web of connections, creating change does not involve flicking any simple switches. Which might lead us to ask: why do complex systems change their behavior? Complex adaptive systems change so they can maintain a state of balance in relation to a changing environment. Homeostasis is a state of balance providing the minimum or essential conditions for life. If the body does not preserve homeostasis by remaining within certain ranges of heat, fluid levels, blood pressure, it will die. Allostasis refers to a slightly different concept – it is the dynamic process of changing states to adapt to the environment. Thus, an optimal state of balance is not static, but always shifting dynamically. Stress is the process of using resources to respond to external or internal factors that push the system out of balance. For example, injury is a stressor that create a stress response. The stress response usually has three stages – alarm, resistance and recovery. Hormesis occurs when a small amount of a certain stressor is beneficial, while larger amounts cause significant harm. Exercise is the best known form of hormesis. The right dose - not too much not too little – helps tune and regulate the stress response system, making us healthier, and better able to withstand the same stressor in the future. What is less well appreciated is that the same rule applies to almost any kind of stressor, including exposure to toxins, heat, cold, anxiety, germs, etc. Thus, health is not necessarily served by reducing all forms of stress as low as possible. Instead, one should seek the optimum dosage of stress – not too high, not too low. When the duration or intensity of stress is too high, the stress response may burn resources faster than they can be replenished. This can lead to a failure in recovery (exhaustion), and/or dysregulation of the stressed subsystem as discussed below. Complexity theorists use the term “state" to refer to all the different ways that a complex system can change in response to stressors or other inputs from the environment. These changes are often nonlinear, which means that small perturbations to the system can produce large changes, or that large perturbations might produce very small changes. A significant non-linear change is called a phase shift. For example, consider how water reacts to a drop in temperature. As the weather drops from 80°F to 40°F, the water will cool, but remain pretty much the same substance. But if the temperature drops another 15 degrees, it will undergo a phase shift and turn into ice. Certain chronic pain states such as allodynia (pain without tissue damage) can be understood as a phase shift in the behavior of the supersystem that governs response to injury. How do complex systems without any central control maintain homeostasis and create adaptive responses to stress? Why does this control just “emerge"? Part of the answer involves the concept of attractors. Although complex systems can potentially arrange themselves into an almost infinite number of different states, there are certain states they tend to move toward. These states are called attractors, and they contribute to stability. Here’s a common metaphor to describe how a dynamic ever-changing system is always attracted back to a particular state. Imagine a ball lying in a deep depression or bowl on uneven ground. If the ball is pushed, it will roll or bounce chaotically to various other points in the bowl, and then eventually settle in the bottom. The bowl is an attractor that maintains the position of the ball within certain limits. A ball dropped onto an uneven landscape will be attracted by wide bowls, and find it hard to escape deep bowls. In the context of pain, we can think of a normal level of pain sensitivity as an attractor to which the system gravitates. An injury will perturb the system and cause an immediate increase in sensitivity near the area of injury (through peripheral inflammation and central sensitization). But after a while, the sensitivity of the system should be attracted back to baseline levels. What if the ball is pushed so hard that it moves over the ridge of one bowl and into another? This is a phase shift which establishes a new attractor. A severe injury might perturb the pain alarm system to such a degree that baseline pain sensitivity levels don't return to normal, even after the injury has healed. Chronic regional pain syndrome (CRPS) is an example of phase shifts causing severe dysregulation of the defense supersystem. 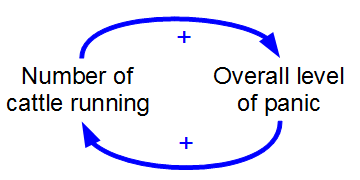 Attractors are partly established by feedback loops. A feedback loop is a pattern whereby a system’s state at one time creates feedback that guides the next round of changes. Feedback loops can be negative or positive. Negative feedback means that when the system detects a change in a particular direction, this will encourage a change in the opposite direction. For example, when a thermostat detects an increase in heat, it will shut the heat off and vice versa. Negative feedback loops therefore contribute to stability. In a positive feedback loop, a change in one direction creates feedback that encourages a similar change. This basically creates a vicious circle. Imagine the behavior of a crowd in a riot, or the stampeding of cattle. Things can get out of control very quickly. A positive feedback loop can create change in the body very quickly, which is necessary to deal with an emergency. Because positive feedback loops move the system away from equilibrium, they are usually under the control of an overarching negative feedback system that prevents loss of balance. Here's an example of how negative and positive feedback loops work together to create an appropriate response to injury. First, positive feedback loops cause a rapid increase in sensitivity to threat: tissue damage causes inflammation, which increases the sensitivity of nociceptors, causing them to fire more often. Increased firing of the nociceptors can cause neurogenic inflammation, which increases the sensitivity of the nociceptors even more. Further, increased levels of nociception will sensitize the dorsal horn of the spine, making it more likely to report nociceptive messages to the brain. This positive feedback loop is a normal part of injury response and helps create the quick changes necessary to mount an emergency response. At some point (and especially after the damage is healed), negative feedback loops should enter the picture to make sure the vicious cycle of pain and inflammation does not continue. One way negative feedback loops helps stabilize pain levels is through descending modulation. This involves the brain sending opioid like substances down the spinal cord, inhibiting the dorsal horn from transmitting nociception. Descending inhibition is reliably triggered by certain kinds of sustained pain, such as immersing your hand in ice water (and by exercise, and probably by foam rolling). Interestingly, many people suffering from chronic pain, including TMJ, IBS, and fibromyalgia, are known to have problems activating descending inhibition. From a systems perspective, this means that their negative feedback loops are not kicking in to control positive feedback loops. Positive feedback loops probably play a major role in allodynia, migraine headache, and a variety of autoimmune disorders. In each case, a stimulus causes the system to get out of control very quickly. The relationships between all the different parts of a complex adaptive system are more important than the parts themselves. For example, the incredible intelligence and complexity of the human brain is owing to its connectivity. In fact, there are more possible connections between neurons in the human brain than there are atoms in the universe. It is a world unto itself, like millions of flocks of birds. In the context of a stressful event such as an injury, the connectivity of the major subsystems - nervous, immune and endocrine - ensures that a response is systematic, global, and highly coordinated. This connectivity creates a hugely complex array of negative and positive feedback loops that organize a response. If you would like to read a lot of heavy detail on the exact nature of the interactions between these different major subsystems, check out the paper here. Following is a very brief summary of the defensive actions of the major players, and then a diagram illustrating their connections. The basic function of the nervous system is to control the body by collecting information in the periphery, transmitting it to the spinal cord and brain, processing that information, and then issuing commands to highly specific parts of the body, including muscles and glands. In the context of protecting the body, this means anticipating and detecting threats, and then creating protective outputs like defensive movements or the conscious experience of pain. These processes happen almost instantaneously with incredible precision, specificity and differentiation. The endocrine system is also an information signaling system, but unlike the nervous system, its effects are slow, prolonged, and far less targeted and specific. This is because it works through the secretion of hormones into the circulatory system from various glands (e.g. pineal, pituitary, and adrenal.) These hormones can serve to protect the body by creating the physiological arousal that helps survive a fight or flight situation. When the emergency has passed, hormone changes encourage a state that promotes healing and recovery. The immune system is responsible for detecting and dealing with threats in the internal environment - detecting and killing microbial invaders, and creating inflammation to heal injuries. Again, the interactions of these three systems are incredibly complex, and are discussed in detail in the paper. Most of this discussion is highly technical and not directly practical to a manual or movement therapist. But I think it's worth it to browse through this section, not so much to memorize each different type of interaction, but to gain a general appreciation for the degree of interconnectedness between the three systems. Here is a diagram of the connections. This paper identifies four types of dysregulation that might cause chronic pain. Biorhythm disturbance. Humans eat, sleep and work according to circadian rhythms, which are controlled by hormonal fluctuations. These rhythms can become disturbed and dysregulated. In fact, sleep problems are correlated with many health problems, including chronic pain. Feedback dysfunction. As noted above, dysregulation of positive and negative feedback loops can lead to allodynia or autoimmune disorders. Incomplete recovery. Stressors affect many systems at the same time. If the level of acute or chronic stressors is excessive, the weakest system may break down by simply running out of resources to complete the stress response. Or, a system might alter its set point in response to a stressor, and then fail to return to normal behavior. An example of this would be the hyper vigilance and hyper reactivity seen in post traumatic stress disorder. Inter-subsystem coordination. When one system is dysreglated, its coordination with other system may also become abnormal. Thank you for reading this far. Are you wondering what to do with any of this information? Personally, I think the systems perspective is an exciting and fascinating way to look at issues of health. It helps us see realities that are otherwise blind spots. And I think in some respects it can create a lot of hope. Here are a few random examples. Some pains are more simple and local while others are more global and complex. But unfortunately many pains are not so simple. Imagine you have long term back pain that is not clearly related to any movement or structural pathology. It is likely that the pain’s cause is more global and complex – meaning that it does not lie in any single factor, but in an imbalanced relationship between the major systems of the body – immune, endocrine and nervous. This is even more likely if you have a disease known to be caused by this type of global dysregulation: diabetes, depression, anxiety, IBS, sleep disorders, autoimmune disorders, fibromyalgia, PTSD and chronic fatigue. Pains associated with these conditions will probably NOT be effectively treated by focusing sole attention on the locally painful areas. The problem doesn’t live there. As Peter O'Sullivan has stated, we should give up looking for a “magic bullet theory” of non-specific low back pain. Instead, because the problem is more about supersystems than subsystems, it should be addressed by interventions that target this more complex and global level. These might include working on diet, sleep, exercise or mindfulness-based stress reduction. These are the “big rocks” that we should make sure have been put in the jar before we start reaching for tiny grains of sand like improving posture or strengthening the core. Many people have huge room for improvement in the way they eat, sleep, exercise or handle stress. They might be more motivated to make those improvements if they better understood the connectivity of all the different systems in the body, and their potential relationship to chronic pain. If rest or optimizing movement patterns does not help a problem that is clearly related to movement, such as a repetitive stress injury, then this pain might involve some degree of local complexity. For example, repetitive stress injuries like tendinosis, plantar fasciitis or tennis elbow may involve dysregulation of the healing and repair process in very small areas. The supersystem that coordinates defensive responses to threat can be set to higher or lower levels of sensitivity. For the sensitive person, whenever there is a threatening stimulus – injury, work stress, illness, lost sleep, eating the wrong food - there is a strong defensive response. The person may feel tired, weak, sore, or otherwise very out of sorts after being exposed to even minor stressors. Many of these people have suffered some form of serious trauma in their lives. On the other hand, some people have a defensive system that remains very stable even in the face of significant threat. These are the people who can run a marathon, get in a car accident, work 80 hours a week, give birth to twins, and still go about their lives with no dip in energy, vitality and well-being. As if nothing happened at all! I think it's a good idea to have some idea where you or your clients lie along this continuum, so you can design interventions that are appropriate for their level of sensitivity to threat. I also think some of my clients have benefited from gaining an understanding that they are particularly sensitive. This helps them be less judgmental with themselves about their difficulty in coping with minor stressors. They know the pain and fatigue they feel is real and not imaginary (even if some of their friends and family have doubts.) Knowing they are sensitive also helps them intelligently manage their stress level to self-regulate. Another useful idea is that sensitivity levels can change. It should be obvious they can easily change for the worse – extreme trauma can cause a phase shift in the behavior of the defensive systems, making them hyper vigilant and hyper responsive. But hyper vigilant systems can slowly shift back to a more functional set point through rest, stress management, graded exposure, and making improvements in general health. Unfortunately, this usually doesn't happen overnight. Because complex systems often change in a non-linear fashion, we can expect progress to be non-linear as well. That means getting better is often a question of moving two steps forward and one step back. In the short term, this makes it difficult to discern positive change. But over a larger timeframe, a pattern of progress may become clear. It's good to keep these patterns in perspective so that short-term setbacks do not cause abandonment of a winning game plan. Further, it's good to keep in mind the idea of a phase shift. If you slowly push that ball up the hill for long enough, you may eventually get over the hump, and experience a huge acceleration in progress. A single person is usually part of a larger social system (a family, workforce, community) that may interact in complex ways. Humans evolved in a social context, and therefore some of our defense mechanisms, including pain, are designed to motivate behaviors that seek help from others. If you are in a social context that continually exposes you to excessive stressors, and causes you to feel that your work is meaningless or under appreciated, this will raise the likelihood that you will experience pain. Our health care system is amazingly good at dealing with acute injuries. It has a long way to go in treating the global, systemic and complex problems that are currently the biggest health problems we face – obesity, diabetes, chronic pain, etc. We can understand the essence of these problems better with the systems perspective, and hopefully this will allow us to see that these problems will not be solved by highly specific interventions like pills, gogi berries, or foam rollers. They will require blunt, nonspecific, but effective instruments for regulating systemic health - diet, exercise, sleep, and stress regulation. These are the fundamentals that get ignored in favor of magic bullets and quick fixes. Please let me know what you think in the comments. And share this is much as possible.